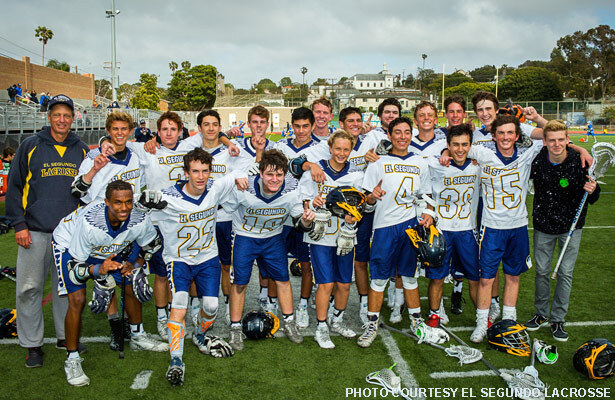 The El Segundo Eagles after capturing their second Ocean League title in a row. No. 18 El Segundo won its 10th consecutive game and second consecutive Ocean League championship Friday, beating No. 20 Culver City 15-8 behind a strong defensive effort from senior Drew Bonney and Co. The Eagles (11-4, 8-0) held the Centaurs to four goals through three quarters in building a 13-4 advantage. 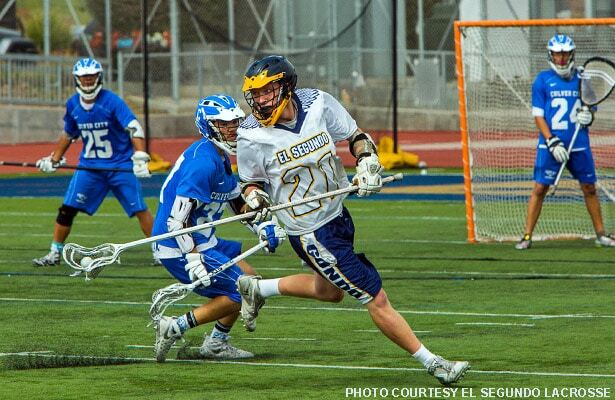 In two victories last week, El Segundo had allowed 14 goals to Santa Monica and 15 to Downey. This week, the Eagles allowed eight each to Beverly Hills and Culver City, winning each game by a wide margin. Senior Drew Bonney and the El Segundo defense kept Culver City in check. Friday, junior attack Cory Lund led the offense with nine goals, five of them coming during a 7-2 third-quarter surge that turned a 6-2 halftime lead into comfortable cushion. Hudson Roles and Rory Cochrane had two goals each, and Lukas Roscoe and Jacob Brockman each scored one. But it was the resurgent defense that made the difference in this one. Goalie Alex Nolan made eight saves, and Bonney (9 ground balls, 9 clears), Cayman Barber and Kai Bucher limited the Centaurs’ opportunities. Sophomore middle Tim Schartz had a big hand in that, as well, winning 18 of 27 face-offs. Peter Pina scored five goals for Culver City (9-7, 6-2).